China Residencies is proud to announce our second and third fiscally-sponsored projects: BUFU, a collaborative living archive on Black and Asian political and cultural relationships, and Yellow Jackets Collective, a queer/intersectional Yellow American collective collaborating towards radical futures that centralize marginalized bodies. "BUFU is a collaborative living archive centered around (pan)Black and (pan)Asian cultural and political relationships. We, the founders of this project, are a collective of queer, femme, non-binary, Black & East-Asian artists and organizers. Our goal is to facilitate a global discourse on the cultural contact between Black & Asian diasporas, with an emphasis on building solidarity, de-centering whiteness, and resurfacing our deeply interconnected and complicated histories. We attempt to achieve this through our collaborative programming, our visual archives, and through building long-term partnerships with collectives, organizations, and individuals. The 5 co-founders started BUFU in September 2015. As BUFU is a generative conversation that necessitates the engagement and participation of our respective communities, we’ve expanded our work through collaborating with multiple partner organizations, collectives, and individuals. This living archive grows through nurturing our relationships and archiving our truths, as Black & Asian folks are all a part of this conversation, this story in the making. In October 2015, one of our co-founders and beloved friend, Jiun Kwon, passed away unexpectedly. The remaining four members (Tsige Tafesse, Katherine Tom, Sonia Choi, and Jazmin Jones) have been working on this project in her legacy and in remembrance of her. Tsige and Katherine lead programming, while Jazmin and Sonia are responsible for the visuals (video production, post-production, and social media), press relations, and general administration." Since 2015, BUFU collected over 200 hours of footage comprising 50 interviews in 5 different languages in Seattle, L.A., Austin, New York City, Seoul, Tokyo, and Osaka. Their content covers interracial dating, hip-hop culture, reality TV stars, ex-patriots, undocumented immigrants, urban clothing brands, reggae concerts, U.S. imperialism, Black Lives Matter activism, journalists, and an interview with Martin Luther King Jr.'s nephew who currently resides in Tokyo. They plan to continue their work by traveling to Ethiopia in December 2016, Jamaica in Spring 2017, and China and in India for June 2017. The documentary component of their project will launch in 2017 on their website through an episodic themed structure featuring all of their shooting locations. - To collaborate on projects that centralize POC/Queer/Femme/marginalized communities. - To actively envision and produce and protect movements that centralize us and decentralize white heteronormative/capitalist supremacy. - To make the model minority myth pay for what it has done to us and our immigrant families. - To make the model minority myth useful to our POC/queer families so we may maneuver whatever privileges we have to distribute knowledge, resources and materials. 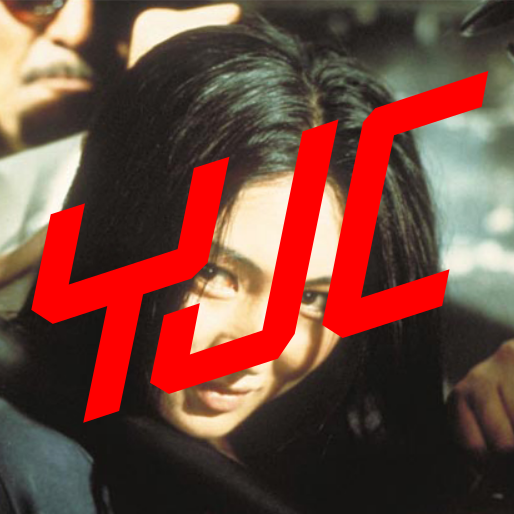 "YJC is a queer/intersectional Yellow American collective collaborating towards radical futures that centralize marginalized bodies. We say Queer because we identify as queer. We refuse to invest in a future that privileges a binary system of classifications meant to contain and reduce the voluptuousness of identities that exist. We say Intersectional because we believe that no person is free unless we are all free. This means that when we talk about race we talk about gender and class and geopolitics and privilege and sexuality and everything else. We focus on relational values and solidarity/affinity work because we refuse to assume that truth or productivity are ever absolute/unquestionable rather than socially constructed. We say Yellow because we will not contribute to the erasure of those in the Asian diaspora that are not East Asian. We can only claim to speak for and represent our specific experiences as yellow femmes who grew up in white spaces in the US. The rest of the work for us is collaborative and affinity based, because our brown/non-yellow/non-US Asian fams, as well as the rest of our POC/queer fam, speak for themselves. We say Collaborative because yellowness must support and speak on oppressions outside of our own, without taking credit for or leading in spaces that were created by and for specific identities other than our own. Especially those oppressions we have historically contributed to (antiblackness, transphobia, erasure of other Asian diasporic people, etc.) We need to be there to lift and to cherish and to receive similar gifts in return, but never to erase or takeover or silence. We say Radical Futures because we use our creative powers to contribute to the construction of a future with POC/queers at the imaginative core. A radical future is only radical if POC/queers are the ones constructing it. We are tired of investing in anything other than a future that we will thrive in, that we are at the center of, that exists for our growth and love and pleasure. We say Yellow again because at our most powerful we are a YELLOW PERIL and those who oppress us should be afraid. We are watching you. We are making moves." "We are all, in different ways, yellow femmes who grew up in white spaces and learned to scam and challenge systems of white supremacy from within, working our way through academic and cultural institutions. It is our proximity to whiteness that kept us apart for so long, and also what brought us together when we were wakeing to the reality of our queerness and race. Most of our core members went to NYU and knew each other peripherally, but we were busy navigating and pacifying whiteness and remained distant from each other. The alienation we felt in working life post-graduation pushed us into revealing further ways in which we were similar: anxiety as to how our dueling privilege and oppression would push us to be productive, the complexities of our individual identity politics, and a deep, endless anger towards white supremacy that burned constant, even in darker moments of assimilation and self-denial. It is this anger, equal parts revenge, bitterness, and overwhelming love for our communities, from which YJC rose. It is the love in this anger that sustains us for our communities are full of power, grace and beauty our current system cannot even begin to imagine." Throughout the month of June 2016, BUFU transformed 283 Greene Avenue, Brooklyn, a two thousand square foot warehouse space into BUFU Studios, a physical extension of their living archive project. BUFU Studios was created as a physical hub to both showcase the raw footage from Seoul, Tokyo, and Osaka, and to create an intergenerational, multimedia space centering queer, poor, POC, and other marginalized bodies by providing free programming around the themes of Black & Asian Futurity & Solidarity. Collaborating with over fifty organizations and individuals, BUFU programmed over one-hundred events including talks, dinners, jams, film screenings, dance classes, healing practices, and performances, seven days a week throughout the month of June. BUFU Studios created a different theme for each day (BUFU Heals, Works, Eats, Films, Sessions, Talks, and Jams) to allow the community multiple entry points into conversations on Black & Asian solidarity. In the space, BUFU had a list of community agreements that were collectively created with their collaborators and implemented by their community leaders. Through this document, BUFU was able to ground the exhibit to center poor, queer, disabled, POC and all other marginalized bodies. Read more about BUFU Studios in Vice. “Scamming the Patriarchy,” hosted by the New Museum, was a youth-led convening on Feminism, as part of a collaborative curation with other QTPOC organizations such as House of Ladosha, Discwoman, and Brujas. “As part of the Education Department’s R&D Season: DEMOCRACY, the New Museum hosted a youth summit and celebration organized by an emerging generation of artists, writers, and activists, including BUFU, brujas, Discwoman, and members of House of LaDosha. The summit included numerous workshops organized around five guiding principles: healing, self-love, skill building, political education, and empowerment. The programming looked to the future of gender politics, focused on methods for forging the worlds youth want to inhabit, while grounding this work in legacies of the past. Programming centered on confronting inequality and injustice, supporting spiritual and economic sustainability, and cultivating a space to turn up with women, femmes, “the dolls,” and all queer kinfolk at the forefront.” We started organizing the event from early September to program different events around the five guiding principles." Read more about Scamming The Patriarchy in the Creators Project. 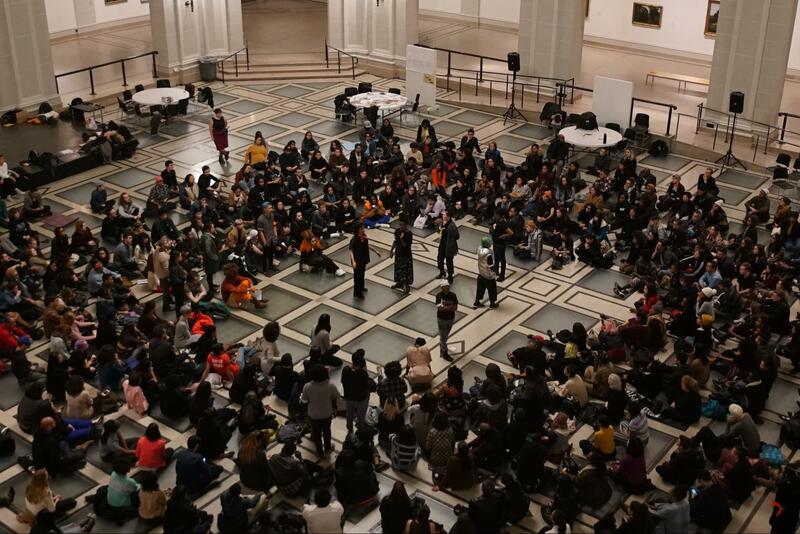 On November 10th, two days after the election of Donald Trump, BUFU had a reactionary emergency response organized with their sister collective, Yellow Jackets Collective at the Brooklyn Museum as a way to hold space and center POC folks called “Process/Mourn/Activate”. Hosted by the Brooklyn Museum, the event held an urgency to a large variety of folks from different backgrounds. Similarly to BUFU's past programming methods, BUFU and YJC co-organized multiple entry points for people to process, connect, and organize. Read more about Process / Mourn / Activate in the Fader. BUFU & YJC holding space during Process / Mourn / Activate in the Brooklyn Museum's atrium. Fiscal sponsorship is a financial and legal system by which a legally recognized 501(c)(3) nonprofit organization (like us) provides limited financial and legal oversight for a project initiated independently by another entity. China Residencies' fiscal sponsorship program helps residencies and creative projects aligned with our mission by providing an opportunity for these projects to receive grants and tax-deductible contributions from individual donors.